The way journalists work and how the public gets its news have changed dramatically. The media landscape has evolved and converged, and to succeed, journalism students must learn the fundamentals of journalism — how to research, write, and tell a great story — and use these skills in an increasingly digital world. The Missouri Group continues to offer the best coverage of the basics while keeping pace with the trends in the field. 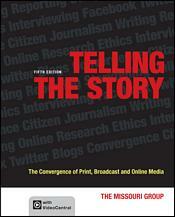 In Telling the Story, 5th edition, The Missouri Group goes even further with concise, how-to coverage of the new journalistic skills that take advantage of new technologies — from blogging to researching online, to using social media and conducting online interviews.